As iPhone and iPad have various powerful features, we receive much more information than just calls and texts. Hence, font get our concern especially when we reading the screen. Different people have different taste for fonts, just like that they have for coffee. However, Apple doesn’t let you change the font style on your iPhone or iPad. But still, if you’re eager to change and modify the font style on iOS devices, then you can have a look at these tricks in this article. Some of these tricks need Jailbreaking of your iPhone but other don’t. Let’s dive into these tricks to customize the font of your iPhone as you like. Bonus tips: If you lost any important contacts or messages from iPhone, you can always use Gihosoft iPhone Data Recovery to recover the deleted iPhone contacts and messages even without backup. Apple has made many changes to its iOS system font from time to time throughout its development. Till now the font San Francisco is still active in the new iOS 11 and 12. Although it’s a pity that there is no way to change the system font styles without jailbreaking your iPhone, you can use an app to customize your fonts in applications in no need of jailbreak. The app is AnyFont, a great app that provides access to various fonts without any restrictions on iPhone, though you need to pay for it. After downloading .tcc file into your device, open it with AnyFont app to add the font. As it display a list of fonts, select and install that font by tapping on it. Then close the AnyFont app once the process finished. Now you will experience the desired font in all your apps on your iPhone. Though it’s helpful, AnyFont cannot change the system font. The only way to change the system font of your iPhone/iPad, is by Jailbreaking the iOS device. There’s no other way than jailbreaking the device as we need system access to change the settings of System fonts, for Apple applies strict restriction on its devices for privacy. Please note that jailbreaking your iPhone/iPad will void your device warranty and you will not be able to receive any OTA updates from Apple. And make sure you’re following the right procedure of jailbreaking, or you may lose data and even your device may get corrupt which you may not fix again. It is better to back-up your device data before Jailbreaking your device. After Jailbreaking your iPhone/iPad), install Cydia the App Store of jailbroken iPhone. 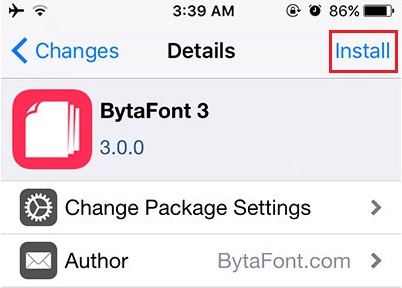 There’s an app named BytaFont which can change the System font completely if your device is successfully jailbroken. 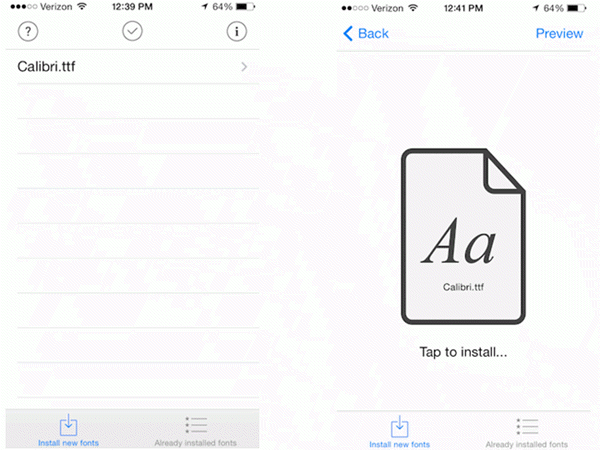 Install BytaFont app from Cydia on your jailbroken iPhone. Browsw fonts in the app and tap the one you like to download. 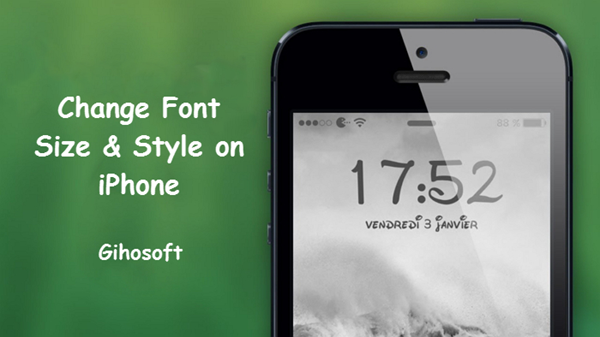 Once you download the font, open BytaFont app again to activate the font on iPhone. It will then restart your iPhone, and afterwards, the new font will be applied to your iOS system. Although Apple doesn’t allow you to change the System font, you can always change the font size anytime you want from the device’s settings, and the steps is pretty simple and easy. 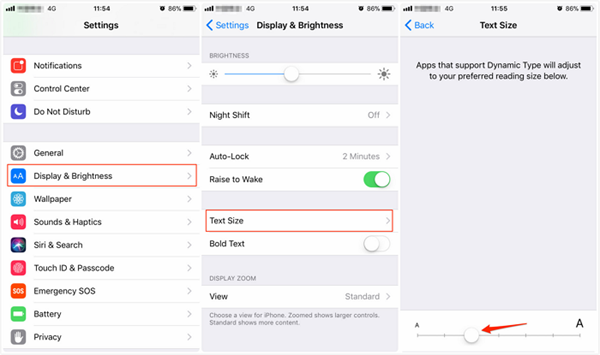 If you’re on iOS 11 or later versions, go to Settings > Display & Brightness > Text Size, and then move the slider to increase or decrease the size of the font. If you’re on iOS 10 or earlier, then go to Settings > General > Text Size. 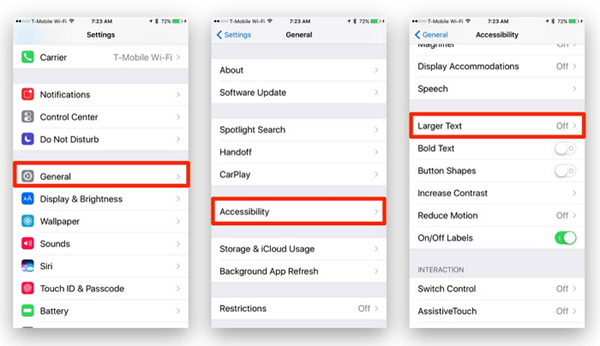 Moreover, if you want font size larger than the maximum offered by Text Size feature, go to Settings > General > Accessibility > Larger Text. As you can see, among al these methods, changing a Font Size is easiest, which can be done simply through system settings since it doesn’t need to disobey device’s restriction. If you are determined to change the system font of your iPhone, please be cautious and careful with jailbreaking for its risk. And we welcome any question or suggestion related to the same topic in the comments below.